South Pointe’s Cottage, Village and Manor Series homes offer buyers a combined 19 floor plans, ranging in size from 1,900 to 4,200 square feet. This award-winning community has two model homes available daily for tours. From the Cottage Series, The Jewell is a two-story home located at 3203 Carrington Drive. With more than 2,900 square feet of living space, the home includes four bedrooms, three full baths, a game room and media room with a two-car garage. 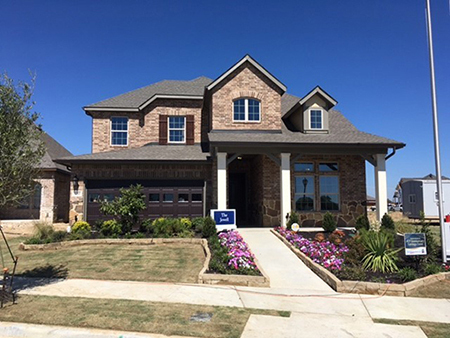 The second model home from the South Pointe Village Series, The Annabella, is located at 3201 Carrington Drive. This home features 3,000 square feet of living space, including four bedrooms, a retreat, three full baths, one half bath and a two-car garage. Weekley also has several showcase homes available for immediate move-in or ready soon, including the one-story Roseburg from the Manor Series. Priced at $438,599, this home offers four bedrooms, a study, three full baths, one half bath and a two-car garage. The home also features 10-foot ceilings, a gourmet kitchen with gas cooktop and additional storage space in the garage. Homeowners in South Pointe enjoy a variety of amenities, including the amenity center with resort-style pool and nearby ponds, trails, parks and sitting areas for exploring the outdoors. The community will offer future Mansfield ISD schools onsite, as well as shopping and dining options. The Jewell, one of two David Weekley model homes in South Pointe, is open daily for tours.